Help the patrol leader plan and lead patrol meetings and activities. Help the patrol leader keep patrol members informed. 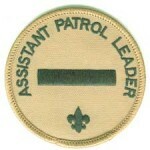 Lead the patrol in the patrol leader’s absence. Help the patrol leader prepare the patrol to take part in all troop activities. Complete two Good Turns or service projects approved by the patrol leaders’ council. Have a representative attend at least three patrol leaders’ council meetings.